to our expert tool makers. Our human resources are the key to the quality work our customers know us for. 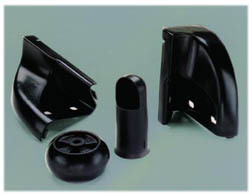 Tesan Mould Inc. designs and builds some of the most complex injection moulds required by the automotive industry. 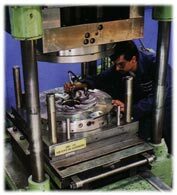 We have the expertise and the technical equipment to manufacture moulds for both plastic injection and die-casting applications. We welcome the challenges of the automotive industry with its leading-edge modern technology. 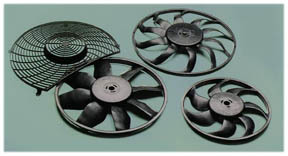 Engine cooling fans and protective grids requre high precision moulds. 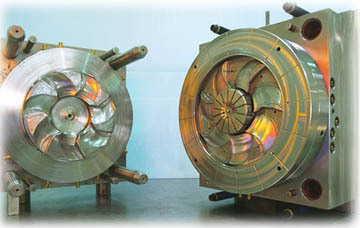 The complex shape of the fans pictured are a challenge we are fully equippped to handle from design concept to the final mould. We designed and manufactured the moulds to make these step pads for utility trucks. Pictured here are a variety of automotive components such as running board end caps, air intake and support-wheel.